The plants growing on the water's edge, the banks of rivers and creeks and along the edges of wetlands are referred to as 'riparian vegetation'. 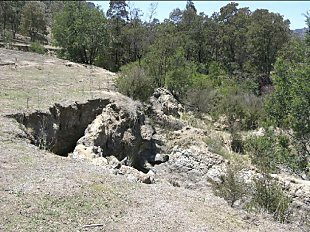 Riparian vegetation can include trees, shrubs, grasses and vines in a complex structure of groundcovers, understorey and canopy. Native riparian vegetation forms an important part of a healthy functioning ecosystem and has many important ecological benefits. 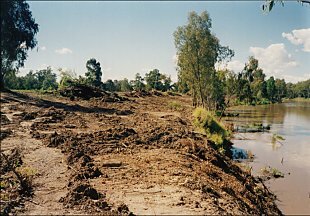 At a local scale riparian vegetation is frequently degraded by clearing or by activities such as gravel extraction, cropping and livestock grazing and trampling. On a catchment scale, changes in water flow regimes often affect riparian vegetation. The effect can be direct, for example, the construction of a weir drowns the riparian vegetation immediately upstream. The effects can also be indirect, for example, when water regulation causes long-term low flow conditions banks can slump, floodplains can be cut off from waterways and flooding patterns altered. 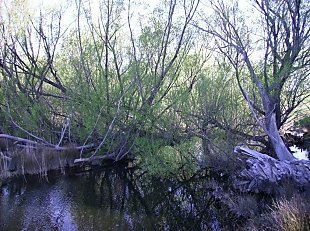 trees such as willows have a tendency to grow into a waterway. Their tight root systems form obstructions and can cause water to be diverted around them into banks, causing erosion. 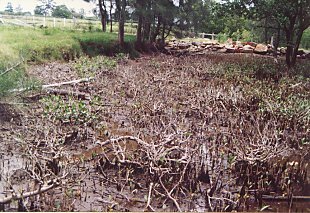 The degradation of riparian vegetation has been identified as a Key Threatening Process to the continuing survival of several species of native fish in Australia.